Last Friday, 60 students from Years 7 to 11 took part in a 21-mile relay swim in the leisure centre pool, to raise funds for this year’s school prom. Inspired by a Channel swim completed by six Bridgnorth Endowed pupils in 1979, the House Captains felt it would not only be an exciting challenge, but also a fitting tribute to mark the 40th anniversary. 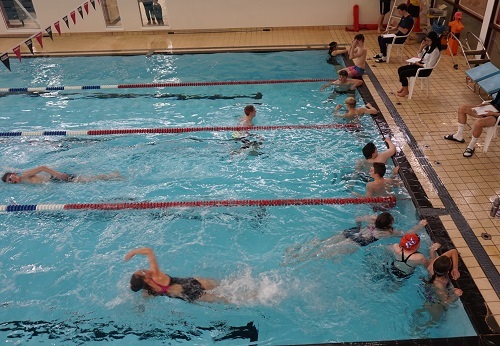 The whole school got fully behind the Year 11 fundraiser, with swimmers taking it in turns to tackle the 1320-length distance during the five-hour event. 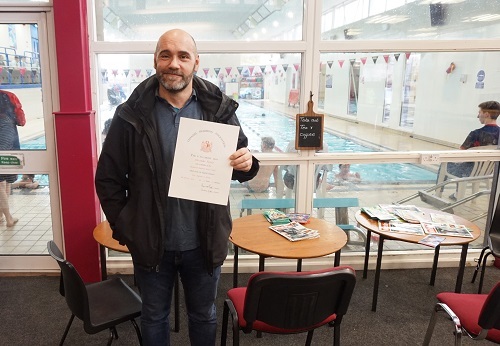 They, in fact, exceeded their target by miles with a final tally of 50,125 metres, which equates to 2005 lengths of the pool or just over 31 miles. On the day, pupils and staff were extremely honoured to welcome two of the swimmers from the 1979 team – Alex Ferrier and Bobby Sherwood. They shared incredible stories of their crossing, which took 13 hours and 34 minutes, with memories of the freezing cold water, swarms of jellyfish, and enormous swell caused by passing ferries. At one point, when hit by fog, the swimmer in the Channel at the time had to tread water for 40 minutes as they were unable continue for safety reasons, and getting onto the boat would terminate the attempt. In the end, the team returned to Bridgnorth as conquering heroes and were all given the Freedom of the Town, later hearing that they had won an award for completing the fastest junior relay swim that year. This impressive accomplishment in the school’s history provided the ideal challenge for students to raise money for the 2019 Prom and make the highly-anticipated milestone event a night to remember.